It looks like something one may have seen before… and yet Crystal Collection is in fact the latest collection from Jacob & Co. This subtly blended creation is inspired by the diversity of the Jacob & Co range and offers a new twist on the existing Five Time, World is Yours and Crystal Collection models. 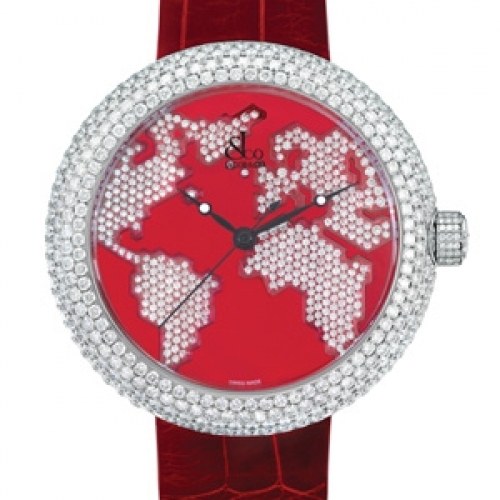 Its dial is adorned with diamond-pavé continents on an enamel ocean, the unmistakable brand signature. This boldly red timepiece evokes both glamour and passion, while maintaining superb Swiss craftsmanship. Additional gem-set models in steel or rose gold versions are also available, featuring dials with Roman numeral, a skull or a flurry of diamonds.